The great part of Apple Music is that it enables users to get access to millions of songs by paying only a few dollars every month. Getting new trending music has never been easier before. If you enjoy exploring and downloading music everyday, your iTunes on computer or Music app on iPhone will be quickly jammed with different genres of sound tracks like R&B, pop, classic, hip-hop and so on. With that in mind, what would you do if your Windows/Mac computers, iOS devices are running out of space? Well, the easiest way is to organize your music library and delete the duplicate songs or the ones you don't want anymore. Deleting songs from iTunes can be a simple task, but it may has some hidden complexities that prevent you from removing the tracks successfully especially when you have the songs backed up on iCloud with the iTunes Match or Apple Music. Luckily, this ultimate tutorial will cover all the info you need. 1. 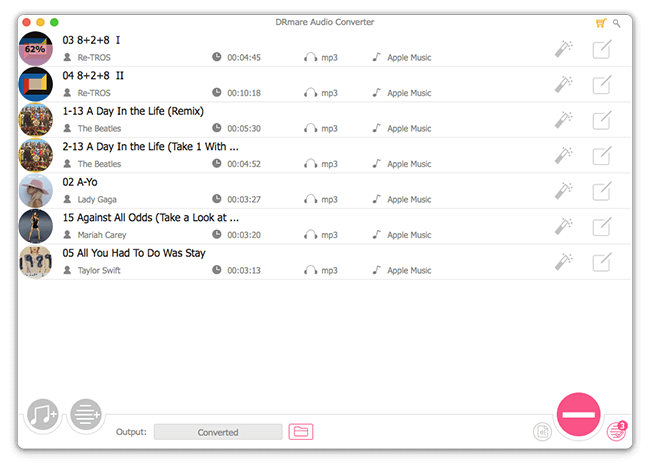 Open iTunes from your Windows PC or Mac. 2. Select the category as "Music" from the top left corner. 3. Go to the "Library" tab to find the songs or albums you want to remove. 4. 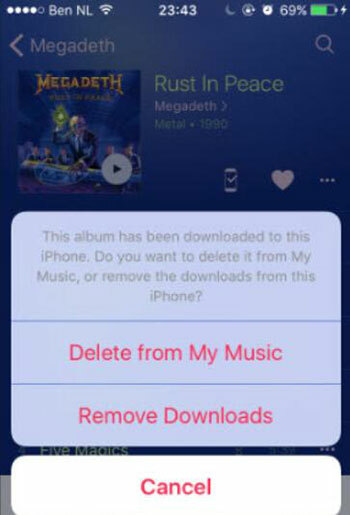 You can select multiple songs or albums, right click on them and then choose the right option to delete them. Depending on different versions of iTunes, the options may include "Remove Download", "Delete Song", "Keep File", "Move to Trash" and "Cancel". 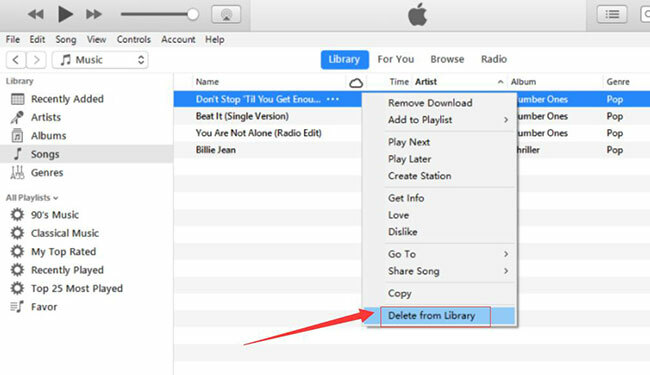 "Delete Song" will remove the song from your iTunes library, computer folder as well as your iCloud Music Library. "Keep File" will only remove the shortcut of the file on iTunes but still keep them on your computer and iCloud. "Move to Trash" will remove the songs from iTunes and move it to trash. "Cancel" will not delete anything. If you delete song under the playlists by right-clicking and choosing "Delete", generally the songs will only be removed from the playlist but still kept on your computer. To make sure you delete the music permanently from your hard drive, you can try this new method for playlists. 1. Select the songs you want to remove. 2. Hold down the "Option" + “Control" + "Delete" on Windows or "Option" + "Command" + "Delete" on Mac. 3. On the popup menu, choose "Delete Song", then the songs won't exist on your computer anymore. Usually when you delete the Apple Music files from iTunes, the same songs on your iPhone will be removed automatically. But if you'd prefer to delete the tracks from your iPhone directly instead of iTunes, you can also try the following two methods delete music from iPhone by using Music app or Settings app. There is not a same iTunes version on iPhone like computers. Its features are split to several parts iTunes Store, App Store, Music app, Settings. 1. Open your iPhone with iOS 9 system or above and launch the Settings app. 2. Tap "General" > "Storage & iCloud Usage", you will see a list of apps installed. 3. Tap "Music" app and tap "Edit" from the top right corner. 4. You can click "All Songs" to choose to delete all songs with one click or choose a specific album or artist to delete. You can do it via your iDevice such as iPhone, iPad or iPod Touch. 1. Launch the Music app from your iPhone. 2. Locate the songs, album, artist which you want to get rid of from your device. 3. Tap the 3-dot icon, you will see several menus "Delete from My Music", "Remove Download" or "Cancel". 4. You can choose "Delete from My Music" if you want to remove them from all the devices including iCloud or "Remove Download" to remove the downloaded files from your current device only. If you choose to delete the downloaded Apple from your current device only, then the music will still be available on iCloud Library. In the future, you can try to sync all the songs back when you get a new device with enough space. On the other hand, if you delete songs from iCloud too, then it is impossible to recover them unless you try again to build the playlist manually. It will take a significantly long time. 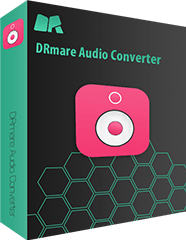 To avoid the problem of losing music, you can also use the DRmare Apple Sound Converter for Windows/Mac to help you backup Apple Music files before deleting. Besides, it makes it easy to clean your music library. If you are interested in it, you can click the "Download" button to download the right Windows or Mac version to your computer. Then you can add the M4P music files and one click to convert them. For more tips, you can also visit: How to Backup Apple Music to MP3.